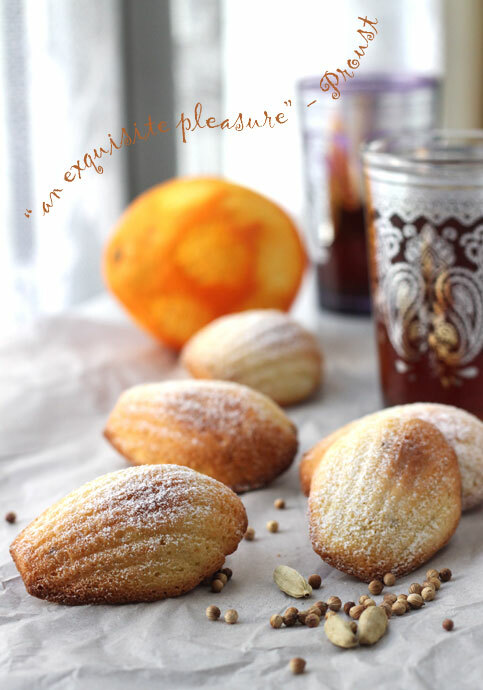 Alchemy in the Kitchen: Orange, Cardamom & Coriander Madeleines – It's not what you've got, it's how you use it! 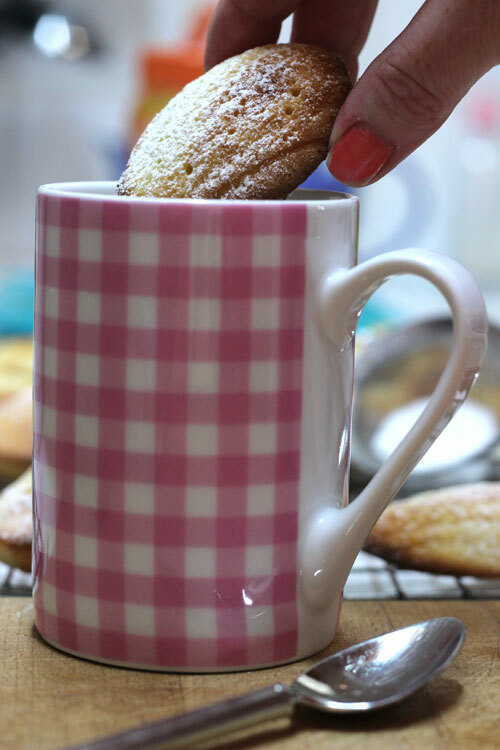 Orange, Cardamom & Coriander Madeleines – It's not what you've got, it's how you use it! For Café Europe - a cultural initiative held as part of Austria’s EU presidency in 2006 - Ireland offered scones, and France offered the Madeleine. While very different products, scones and Madeleines have some things in common – flour, sugar, butter, and social ambition. While both had relatively humble beginnings, they were adopted by high society – the scone becoming an essential part of ‘Afternoon Tea’, made fashionable by a rather peckish Anna Duchess of Bedford in the mid-nineteenth Century. The Madeleine (according to one account) was already a favourite at Versailles, adopted by the Court of Louis XV a century earlier. Both got a little lift from the invention of baking powder. There the similarity ends. Perhaps it's a lesson in "It's not what you've got, it's how you use it!" In Remembrance of Things Past, Marcel Proust’s narrator famously has a foodgasm brought on by the Madeleine. He doesn’t mention scones. In a medium saucepan, melt the butter over a medium to high heat (use a light-coloured saucepan such as stainless steel if possible as it allows you to see the colour change in the butter that indicates it has reached the right point). Once melted, let it continue to foam and splutter, swirling occasionally to make sure it is heating evenly. As the foaming and spluttering dies down, the butter will continue to darken from yellow, to golden, to toasty brown. The butter will also begin to smell a little nutty. The milk solids in the butter will separate out and sink to the bottom. Remove the pan from the hob and pour into a heatproof bowl or jug to cool to room temperature, leaving as much of the milk solid residue behind as possible (If you leave the melted butter in the pan, it will continue to cook in the residual heat and may burn). Remove 2 tablespoons of the melted butter right away – you’ll need this to brush the cake tins later – cover and keep it at room temperature so that it remains liquid. Put the eggs in a large bowl and add the sugar. Whisk until pale, pale yellow and has thickened to the ‘ribbon’ stage – the whisk will leave a trail as you move it through the mixture and when you lift the whisk, the batter will fall in a ribbon and stay on the surface for a couple of moments before slowly disappearing back into the mixture. 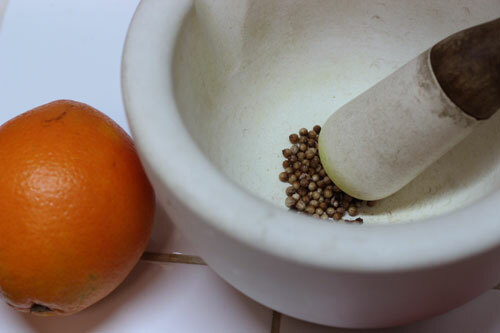 Add the salt, orange zest and ground spices. Trickle in the cooled butter, whisking all the while until incorporated into the batter. 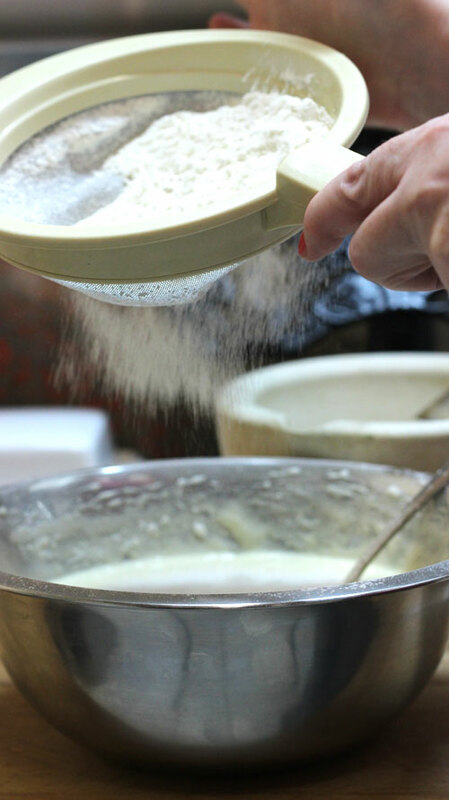 Add the baking powder to the flour and sift about one-third onto the surface of the batter. Using a metal spoon such as a dessertspoon, gently fold the flour into the batter. Repeat twice more until you have folded all the flour into the mixture. Cover with cling film, pressing down lightly so that it is in contact with the surface of the batter. Chill in the refrigerator for at least an hour or overnight if possible. 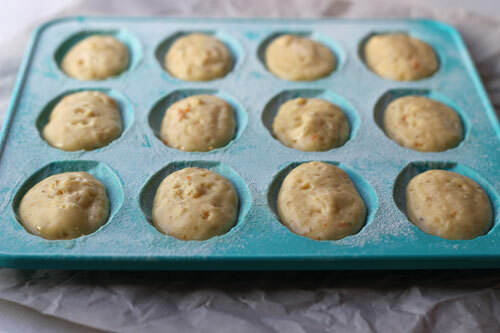 When ready to bake, pre-heat the oven to 180°C. 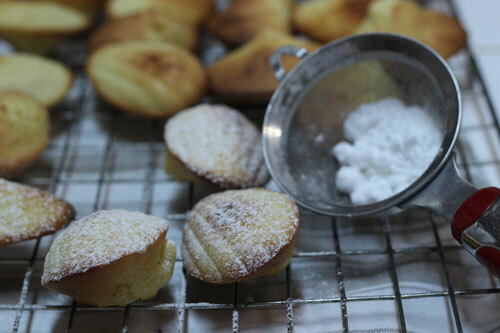 Brush the Madeleine tins lightly with the reserved melted butter and sprinkle lightly with flour, tapping off the excess. 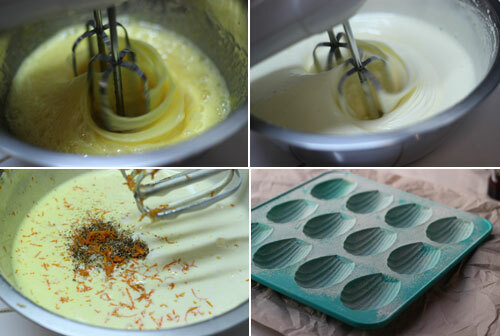 Divide the batter evenly between the tins filling no more than about three-quarters full (an ice cream scoop or piping bag is good for even portioning). Don’t bother to spread the batter out to the edges - gravity will do the work for you. Don't bother spreading the batter to the edges - gravity will do the work for you! Transfer to the pre-heated oven and bake for 8 to 10 minutes or until risen and golden and spring back under the touch of a finger. 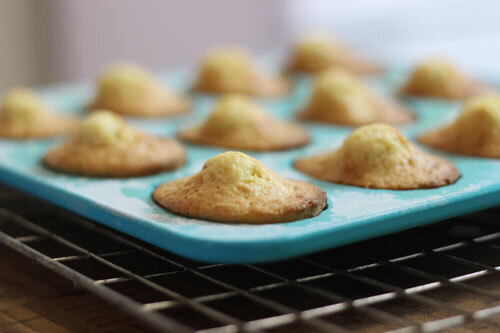 If the God of Madeleines has been kind, they should have formed a ‘dromedary’ hump (which I always thought was a defect, but turns out to be Madeleine perfection – who knew!). Remove from the oven and leave in the tin for a minute or so before tipping gently out of their shells onto a wire rack to cool. They freeze marvelously and are restored to oven-fresh magnificence after about 12 seconds in the microwave. If you are going to freeze them do so now, without their sugar dusting. If they are to be eaten now, once cool, dust with icing sugar and consume with a decent cup of tea or a glass of sticky dessert wine. You could also dip them in good dark chocolate or white chocolate. Now that's a perfect hump! I love the warm spices you have used in those Madeleines. Madaleines are a lovely treat with a cup of tea. They don't last very long so I only make them when we've got hungry people around. Yours are beautiful!